Version 15.05 represents the most substantial release in the history of Genode. It is packed with profound architectural improvements, new device drivers, the extension of the supported base platforms, and a brand new documentation. With the new documentation introduced in Section Comprehensive architectural documentation, the project reaches a mile stone. On our mission to find the right architectural abstractions, the past years had a strong research focus. We conducted countless of experiments, gathered experience with highly diverse hardware platforms and kernels, and explored application scenarios. Our target audience used to be technology enthusiasts. Now that we have reached a point where the architecture is mature, it is the time to invite a wider audience, in particular people who are interested in building Genode-based solutions. The new book "Genode Foundations" equips the reader with the holistic view and the technological insights needed to get started. 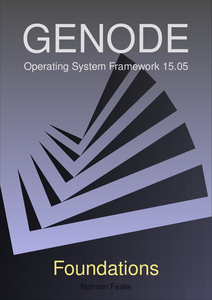 Genode's custom kernel platform, originally conceived as a research vehicle, has become feature complete. As explained in Section Feature completion of our custom kernel (base-hw), the release contains three substantial additions. First, with the added support for the 64-bit x86 architecture, the kernel moves beyond the realms of the ARM architecture. This line of work is particularly exciting because it was conducted outside of Genode Labs, by the developers of the Muen separation kernel. The second addition introduces kernel-protected capabilities to the base-hw kernel. This was the last missing functionality that stood in the way of using the kernel in security-critical scenarios. Finally, the kernel's scheduler received the ability to handle thread weights in a dynamic fashion. With revising the framework's device-driver infrastructure as described in Section Revised device-driver infrastructure, this release addresses long-standing architectural limitations with respect to the effective confinement of device drivers. This topic encompasses changes in the NOVA kernel, a redesign of the fundamental interfaces for user-level device drivers, the design and implementation of a new platform driver, and the adaptation of the drivers. Speaking of device drivers, the version 15.05 comes with a new AHCI driver, new audio drivers ported from OpenBSD, new SD-card drivers for the Raspberry Pi and i.MX53, platform support for i.MX6, and multi-touch support. The icing on the cake is the added support for the seL4 kernel as Genode base platform. Section Proof-of-concept support for the seL4 kernel covers this undertaking. Even though this work is still in its infancy, we are happy to present the first simple Genode scenarios running on this kernel. The book is published under the Creative Commons Attribution + ShareAlike License (CC-BY-SA) and can be downloaded as PDF document. It first presents the motivation behind our project, followed by a thorough description of the Genode OS architecture. The conceptual material is complemented with practical information for developers and a discussion of framework internals. The second part of the book serves as a reference of Genode's programming interfaces. In the upcoming weeks, we plan to update the documentation section of the genode.org website with the new material. Until then, we hope you find the book enjoyable. One of the fundamental concepts used within Genode are capabilities. Although this security mechanism was present in the Genode API from the very beginning, our base-hw kernel could not guarantee the integrity of capabilities so far. On top of this kernel, capabilities used to be represented as global IDs that could get forged easily until now. With this release, we introduce a major change of base-hw, which now supports capability ID spaces per component. That means every component respectively protection-domain has its own local name space for kernel objects. When a component invokes a capability to access an RPC object, it provides the corresponding capability ID to the kernel's system call. The kernel maintains a tree of capability IDs per protection domain and can retrieve whether the provided ID is valid and to which kernel object it points to. As all kernel objects are constructed on behalf of the core process first, this component always owns the initial capability during the lifetime of a kernel object. Other components can obtain capabilities via remote-procedure calls (RPC) only. Whenever a capability is part of a message transfer between threads, the kernel translates the capability IDs within the message buffer from one protection domain's capability space to another. If the target protection domain does not own the capability during the transfer already, the kernel creates a new capability ID for the receiving protection domain. In contrast to other capability-based kernels that Genode supports, the base-hw kernel manages the capability space on behalf of the components. Nevertheless, as the kernel does not know whether a component is still using a capability ID, even though the kernel object behind it got invalidated already, components have to inform the kernel when a capability ID is not used anymore so that is can be reused again. Therefore, we introduce a new system-call delete_cap, which frees a capability ID from the local protection domain. To allocate entries in the capability space of components, the kernel needs memory. The required memory is taken from the RAM quota a component provides to its protection-domain session. If the kernel determines that the quota does not fulfill the requirements when a component wants to receive capabilities, the corresponding system-call delivers an error before the actual IPC operation takes place. The component first has to upgrade the RAM quota before it can retry its IPC operation. The procedure of IPC error-handling is transparent to the developer and already solved by the base library implementation for the base-hw kernel. The Muen Separation Kernel is an Open-Source microkernel, which uses the SPARK programming language to enable light-weight formal methods for high assurance. The 64-bit x86 kernel, currently consisting of a little over 5'000 LOC, makes extensive use of the latest Intel virtualization features and has been formally proven to contain no runtime errors at the source-code level. As the core team of the Muen SK, we were intrigued by the idea of bringing Genode to our kernel. In our view, combining Genode with the Muen project makes perfect sense as it would allow us to leverage the entire OS framework instead of re-inventing the wheel by implementing yet another user land. To this end, we met the Genode team in their very cosy office in Dresden. After a tour of the premises, we got right down to business: Norman gave us a whirlwind tour of Genode and it was quickly decided that the way forward would be to run base-hw as a subject on top of Muen. As an intermediate step, we needed to port base-hw from ARM to Intel x86_64 first. The Genode team gave us a head start by setting a roadmap and doing the initial steps of extending the create_builddir tool and adding the hw_x86_64 skeleton in a joint coding session. After this productive workshop, we flew back to Switzerland with a clear picture of how to proceed. We closely followed the roadmap for porting the base-hw kernel to the 64-bit x86 architecture. The following list discusses the work items in detail, summarizing the interesting points. Prior to the addition of our x86_64 port, base-hw was an ARM-only kernel. Therefore, the boot code for the new platform had to be written from scratch. Having already written a 64-bit x86 kernel, we were able to reuse its boot up code pretty much unchanged. Since transitioning to the IA-32e (long) mode requires paging, an initial set of static page tables is part of the assembler startup code. For dynamic memory management support however, a C++ implementation for creating IA-32e paging structures was required. Similar to the startup code, we could draw from the experiences made when implementing paging in the Muen project. One minor obstacle was to get reacquainted with the C++ template mechanism. Aside from that, there were no other issues and the subsequent implementation was quite straight-forward. The mode-transition code (MTC) takes care of switching from kernel- to user-space and back. It consists of architecture-dependent assembly code accessible to both kernel- and user-land. A transition from user- to kernel-space occurs either explicitly by the invocation of a syscall, or when an exception or interrupt occurs. The mode-transition code saves the current context and restores the kernel state or vice-versa when returning to user-mode from the kernel. To unify the exception and syscall code paths on exit, we decided to implement syscall invocation using the int 0x80 method instead of using the SYSCALL/SYSRET machine instructions. The peculiarities of the x86 architecture needed some attention to detail. In contrast to ARM, several data structures such as the GDT (Global Descriptor Table), IDT (Interrupt Descriptor Table) and TSS (Task-State Segment) are implicitly referenced by the hardware and must be accessible on entry into the mode-transition code from user-land. Thus, these tables must be placed in the MTC memory region as otherwise, the hardware would trigger a page fault. The interrupt controller handles external interrupts triggered by devices. After a little detour (see PIC/PIT detour below), we ended up using the local and I/O APIC for interrupt management. One annoying implementation detail worth mentioning is the handling of edge-triggered interrupts by the I/O APIC. As described in the Intel 82093AA I/O Advanced Programmable Interrupt Controller (IOAPIC) specification, Section 3.4.2, edge-triggered interrupts are lost if they occur while the mask bit of the corresponding I/O APIC RTE (Routing Table Entry) is set. Therefore, we chose the pragmatic approach not to mask edge-sensitive IRQs at all. The issue of lost IRQs came up when dealing with the user-space PIT (Programmable Interval Timer): The PIT driver would program the timer with a short timeout and then unmask the corresponding IRQ line. If the timer fired prior to completion of the unmask operation, the interrupt would be lost, which, in turn, resulted in the driver being blocked forever. The x86 platform provides a variety of timer sources, each of which bringing its own bag of problems. After switching to the LAPIC for interrupt management, the obvious choice was to use the LAPIC for the kernel timer as well. The drawback of this timer is that its frequency must be measured using a secondary source as reference. Luckily, we were able to reuse the PIT driver, which resulted from our PIC/PIT detour for this purpose. To allow user-space code to use floating-point arithmetics, we needed to handle the state of the x87 FPU. Similar to the ARM code, the FPU state is saved and restored in a lazy manner, meaning the necessary work is only performed if the FPU is actually used. After making a small number of additional adjustments to core, we were able to successfully execute even elaborate run scripts such as run/demo on the newly ported x86_64 base-hw kernel. As described in the introduction, porting the base-hw kernel to the Intel x86_64 architecture is only an intermediate step towards the ultimate goal of bringing Genode to the Muen platform. To this end, we took a pragmatic approach with regards to hardware drivers that are required for x86_64 but will be paravirtualized on Muen. The interrupt controller and kernel timer fall in this category. Because of simplicity reasons, we initially decided to use the 8259 Programmable Interrupt Controller (PIC) and the 8253/8254 Programmable Interval Timer (PIT). We quickly had a working implementation but later became aware that the only currently available Genode user-land timer on x86 was the PIT. This was obviously a problem because, kernel and user-land require separate timer sources. After some discussion, we decided to rewrite the kernel interrupt controller and timer code to use the LAPIC/IOAPIC. This freed up the PIT for use by the user-land driver. Since we were able to reuse the PIT code for measuring the LAPIC timer frequency, the detour was in fact beneficial to stabilize the final implementation. Additionally, these changes lay the foundation for future hw_x86_64 multiprocessor support. Note: Make sure to enable the libports repository by editing the etc/build.conf file. No dynamic memory discovery: The amount of memory is hard-coded to 256 MiB. These are not fundamental restrictions of the base-hw x86_64 port but simply missing features that can be implemented in the future. Considering that the base-hw kernel was an ARM-only microkernel, the port to x86_64 went rather smoothly. In our opinion, this is a testament to the modularity and the good overall design of the kernel. Architecture-specific code is well encapsulated and the provided abstractions allow the overriding of functionality at the appropriate level. An interesting fact worth mentioning is that while emulators such as Qemu and Bochs are great tools for development, it is important to perform tests on real hardware as well. Since the hardware is emulated with varying degrees of accuracy, subtle differences in behavior can go unnoticed. A recurring source of potential problems is the initial state of memory. Whereas emulators usually fill unused memory with zeros, on real hardware the content of uninitialized memory is undefined. So while code that only partially initializes memory may run without issues on Qemu, it is quite possible that it simply fails on real hardware. After finishing the base-hw port to 64-bit x86, we immediately started working on the Muen port. As a little spoiler, we can report that the run/demo scenario is already running as a subject on top of the Muen SK. We hope that it will be part of the next Genode release. Last but not least, we would like to thank the guys at Genode Labs for their support and we are eager to see where this fruitful cooperation will take us. With the Genode release 14.11, we introduced an entirely new scheduler in the base-hw kernel that allows for the trading of CPU time between Genode components. This scheduler knows two parameters for each scheduling context: A priority that models the urgency for low-latency execution and a quota that limits the prioritized execution time of a context during one super period. The user may adjust these parameters according to his demands by the means of userland configuration. Through configuration files, the inter-component distribution of priority and quota is configured whereas the component-internal distribution of computation time is addressed by Genode's thread API. However, during the last months, the way of configuring the local distribution of quota appeared to be not very satisfying for real-world scenarios. To assign quota to a thread, one had to state a specific percentage of the component quota at construction time. One disadvantage of this pattern becomes apparent when looking at the main thread of a component. As the main thread gets constructed by the component's parent without using the thread API, the component itself has no means to influence the quota of this thread. The quota of main threads was therefore always set to zero. Furthermore, a component had to keep track of previously consumed thread quotas to be able to not violate the local quota limit when creating new threads. All this begged for a less rigid way of managing local CPU quota. We came to the conclusion that a component does not want to manage quota distribution itself but only the importance of threads in the quota distribution, their so-called weight. This thread weight can be any number greater than zero regardless of the weights of other threads. It gets translated to a portion of the local quota by setting it into relation to the sum of all local thread weights. Consequently, all the assigned quota of a component is distributed among the local threads according to their weights. There is no slack quota anymore. However, this implies that the quota of all local threads gets adjusted each time the constellation of local thread weights changes. That is when a new thread gets constructed or an existing one gets destructed. So, we must be able to dynamically reconfigure the quota of a scheduling context - something the base-hw kernel wasn't aware of hitherto. The new core-restricted kernel call named thread_quota solves this issue. Finally, if one of the threads is destructed, its quota logically moves to the remaining two threads divided according to their weight ratio. Now, with the comfort of weight-driven quota distribution, there was only the question left, how to determine the weights reasonably. We had to provide a way to translate a concrete need of execution time into a local thread weight. Two things must be known inside a component to do so: The length of a super period at the scheduler and how much of this super period the components quota is worth. These two values can now be read via a new CPU-session RPC named quota. The values returned are given in microseconds. However, when using this instrument, one must consider slight rounding errors that can't be prevented as the values have to pass up to two independent translations from the source parameter to the microseconds value. In Genode, core represents the root of the component hierarchy and holds the reins. This includes possession of system resources not reserved for the kernel, in particular physical resources like RAM, memory-mapped I/O regions, I/O ports, and IRQs. Access to resources is gained via session requests, e.g., an IO_PORT session permits access to a dedicated region of x86 I/O ports. Core itself does not define any policy on these resources other than starting its only child component init, which is qualified to allocate specific resources via dedicated sessions to core. In turn, init employs a configured system policy and bootstraps additional system components. From the physical resources, init manages memory effectively by applying quota restrictions to RAM sessions. It does not further differentiate I/O resources besides routing session requests to the rather abstract services for IRQ, IO_MEM, and IO_PORT. On the other side, device-driver components wish to access registers or drive DMA transfers for specific devices only. What was missing up to now, was the notion of a device including its I/O resources or role as DMA actuator. Motivated by enabling message-signalled interrupt (MSI) support on x86 platforms, we addressed several shortcomings and revised our device-driver infrastructure. First, we noticed that while our ACPI driver (acpi_drv) did a proper job with parsing ACPI tables relevant for IRQ remapping, polarity, and trigger information, it did not apply any useful policy. The gathered information was only propagated to the PCI driver (pci_drv, started as a child component) by writing the IRQ remapping information into the PCI configuration space of the devices. Though, pci_drv provided the PCI session and thereby access to dedicated PCI devices, it did not apply device-specific policies either. The PCI session was merely used by device drivers to retrieve information about I/O resources, but the session request for the actual resources was directed to the driver's parent (and routed to core in most cases). Further, the PCI driver was in charge to allocate DMA-able memory on behalf of the device driver. This enabled transparent support for IOMMUs on NOVA, but also lacked proper quota donation. Last, we identified that the current implementation of handling shared IRQs in core completely contradicted with our goal of transparently handling interrupts as legacy IRQs or MSIs depending on the capabilities of the device as well as the kernel platform. At the end of our survey, we eagerly longed for real I/O resource management in a central component, which provides the notion of a device. I/O resources are assigned to those devices from the pool of abstract resources available from core, e.g., dedicated IO_MEM dataspaces for regions of a PCI device. The approach is not completely new in Genode when looking at certain ARM platforms, where we have had a platform driver (platform_drv) for quite some time. Now, we want to generalize this approach to fit both dynamic discovery (e.g., for the PCI bus) and configuration (e.g., specific ARM SoCs or legacy devices on PCs). Also, the configuration is expected to support the expression of policy to restrict device drivers to access designated device resources only. The first working step to tackle the issue was to make the IRQ resource available per device within the PCI driver. Until now, core implemented the handling of IRQs per platform differently. On some platforms, namely x86, it had support for shared IRQs, while other platforms got along without this special feature. The biggest stumbling block was actually the synchronous RPC interface wait_for_irq(), which forced a driver to issue a blocking IPC to core to wait for IRQs. We simply disposed this relict of the early L4 times and changed the IRQ session interface to employ asynchronous IRQ notifications on all Genode platforms. For that reason, we had to adapt the various core implementations, the platform drivers, and all device drivers. We refactored a generalized shared IRQ implementation on x86 and then, moved it from core to the PCI driver, which will become our platform_drv for x86 in a future step. After we adapted all x86 drivers to request the IRQ session capability from the PCI driver, and completed a thorough testing phase of shared IRQ handling, we finally removed the shared IRQ support from core on all Genode platforms. Next, we tackled the issue to transform the previous PCI session into an x86 platform session (although it is still called PCI session). The platform session bundles I/O resources of one or more devices per client. Policies define, which of the physical devices are actually visible and are discoverable by clients. A client discovers devices either by explicitly naming the device, e.g. for non PCI devices like the PS/2 controller, or by iterating over a virtual PCI bus as defined by the policy. Besides device discovery, a platform session is used for allocating DMA buffers. So, the platform driver can take care of associating DMA memory regions with physical devices, which is required as soon as IOMMUs are used by the underlying kernel. The result of a successful device discovery is a device capability, which serves as the key to get access to device-specific resources like IO_MEM, IO_PORT, and IRQs. The RPC interface provides functions to request dedicated resource capabilities, which are of the types Io_mem_session_capability, Io_port_session_capability, and Irq_session_capability. If the device capability represents a PCI device, the IO_PORT and IO_MEM resources are discovered by the platform driver by parsing the BARs in the PCI configuration space. On behalf of the client, the platform driver establishes the I/O resource sessions to core. For non-PCI devices, a device-specific implementation is required. For now, only the PS/2 device is supported, which bundles two IRQ sessions for mouse and keyboard as well as the well-known I/O ports. The IRQ resources for PCI devices are handled differently. First, the platform driver parses the PCI config space of a device to detect whether this device is capable of MSIs. If so, the platform driver tries to open an IRQ session at core, which succeeds on kernels supporting this feature, namely Fiasco.OC and NOVA. On kernels lacking MSI support, the request will fail and the platform driver falls back to allocate legacy IRQs, which are all treated as shared. In either case, the driver does not need to handle the IRQ/MSI cases separately as these are handled by the platform driver transparently. In the first example, the USB driver gets access to two devices, e.g., the xHCI and EHCI controller. This explicit approach is useful if the target machine and the PCI bus hierarchy are known and security is a concern. Later, a dynamic device-manager component could update the config at runtime according to a device-discovery report of the platform driver. The second option can be used when switching often between machines during development or when the target machine is unknown in advance. The downside of the flexibility is that a device driver may get access to devices it can't or should not drive. For example in a router scenario, the inner network driver should only drive the inner NIC while the outer driver gains access to the outer network. Both components would then be connected by a secure routing component only. Further classes are available and are extended as needed - please consult the README of the platform driver for a list. When the ACPI driver is used for Fiasco.OC, NOVA, and base-hw on x86, the configuration for the PCI driver is constructed out of the ACPI config XML node. Additionally, an explicit policy entry for the ACPI driver is required, which permits rewriting potentially all legacy IRQ numbers for PCI devices as discovered during IRQ-remapping-table parsing. If, for some reason, MSIs should or can not be used, support may be disabled explicitly by setting the irq_mode attribute to nomsi in the policy XML node. The configuration of a non-PCI device is described by a device entry in the policy. With the changes described above, the platform driver is now in the position to hand out solely those devices to drivers, which are explicitly permitted. Furthermore, the platform driver can transparently discover I/O resources and set up the appropriate interrupt scheme for devices, which removes this burden from the device-driver developer. The next steps in this direction are to co-locate and consolidate the PCI and ACPI drivers into the platform driver as done partially for some ARM-based platforms already. Then, the implementation should be generalized to comprise ARM platforms too, which includes the configuration, the usage of the regulator session, and the enforcement of policies per device. Our documentation efforts as mentioned in Section Comprehensive architectural documentation provided the right incentive to revisit the Genode API with the goal to reach API stability over the next year. This section summarizes the API changes that may affect developers using the framework. The semaphore at base/semaphore.h used to be a template, which took the queueing policy as argument. There was a reasonable default, which took a FIFO queue as policy. Since we introduced the semaphore in 2006, we never used a different queueing policy. So this degree of flexibility smells like over-engineering. Hence, we cut it back by hard-wiring the FIFO policy in the semaphore. The packet-stream utilities provided by os/packet_stream.h provide the common code to realize the transfer of bulk data between components in an asynchronous fashion. It is used by several session interfaces such as the NIC session, file-system session, and block session. Until now, however, the utilities used to reside in the root namespace. Now, we have rectified this glitch by moving them to the Genode namespace. We did the same for the commonly used ring-buffer utility provided by os/ring_buffer.h. The XML parser used to represent XML attributes with the nested Xml_node::Attribute class. However, the use of non-trivial nested classes at API level tends to be confusing and difficult to document. Hence, we decided to promote Xml_node::Attribute to a dedicated top-level class. Until now, the set of functions to extract information from text strings has grown rather evolutionary. It became a somehow weird mix of function templates, overloads, and default arguments. To make the Genode API easier to understand, we longed for a simple and more coherent concept. For this reason, we changed the ascii_to functionality of util/string.h in two ways. First, each ascii_to function has become a plain overloaded function - not a kind of template specialization of a function-template signature. In some cases, it may actually be a template, but only if the result type is a template. Second, the "base" argument has been be discarded. It was used to parse numbers with different integer bases (like 16 for hexadecimal numbers). For most types, however, the base argument made not much sense. For this reason, the argument was mostly ignored. Now, the official way to extract integers of different bases would be the introduction of dedicated types similar to the existing Number_of_bytes type. The old-fashioned MBR partition table is on its way out. Its successor, the GUID partition table (GPT), is increasingly used on recent systems. On some, namely the ones featuring UEFI firmware without legacy boot support, it is the only available option. Therefore, we have extended the part_blk server by adding rudimentary support for GPT so that we are able to use Genode on such systems. It will fall back to trying to use the MBR if it does not find a valid GPT header. The current implementation is limited in the following respects. For one, no endian conversion takes place and it therefore only works on little-endian platforms. This poses no problem because, for now, Genode does not run on any big-endian platform anyway. Furthermore, as the GPT specification defines, the content of the name field is encoded in UTF-16 but part_blk will only extract valid ASCII-encoded characters. It also ignores all GPE attributes. We extended the NIC session interface with the ability to notify its client about changes in the link-state of the session. Adding this mechanism was motivated by the need for requesting new network configuration settings, e.g., IP and gateway addresses, when changing the location and switching the network. A NIC-session client can now install a signal handler that is called when the link-state changes. After receiving the signal, the client may query the current state by executing the link_state() RPC function. In addition, the NIC driver interface now provides a notification-callback method that is used to forward link-state changes from the driver to the Nic::Session_component. The lwIP TCP/IP stack was adapted to that feature and always tries to acquire new network settings via DHCP when the link state changes. The following drivers now report link-state changes: dde_ipxe, nic_bridge, and usb_drv. On the other hand, OpenVPN, Linux nic_drv, and the lan9118 driver do not support it and always report the link-up state. When we introduced Genode's file-system session interface in version 12.05, it was accompanied with a RAM file system as the first implementation. Since then, a growing number of file-system services were developed, which took the RAM file system as blue print. Over the years, this practice resulted in the duplication of the utilities that were found worthwhile to reuse. The upcoming addition of a new 9P file-system service prompted us to make those utilities part of the public API, located at os/include/file_system/. With Genode 15.05, we completely revised our AHCI driver in order to overcome some severe limitations of the previous implementation. Specifically, we desired support for multiple devices per controller, handle block requests asynchronously, and consolidate the Exynos5 and the x86 code to enable code sharing of the AHCI-specific features. We also wanted to improve the driver performance by taking advantage of modern features like native command queuing. In order to achieve these goals, we implemented a generic AHCI driver by taking advantage of Genode's MMIO framework. The code is shared between x86 and the Exynos5 platform. Additionally, we introduced a Platform_hba class that takes care of platform-specific initialisation and platform-dependent functions, like the allocation of DMA memory or the handling of the PCI bus on x86 platforms. For supporting multiple devices, we extended Genode's block component by a root component with multiple-session support. Sessions are routed much like it is done for our partition server (part_blk) by using policy XML nodes (see the README file under repos/os/src/drivers/ahci). Since version 15.02, Genode's block component offers support for asynchronous block requests. The AHCI driver takes full advantage of this interface by using native-command queuing (NCQ). NCQ allows up to 32 read/write requests to be executed in parallel. Please note that requests may be processed out of order because NCQ is implemented on the device side, giving the device vendor the opportunity to optimize seek times for hard disks. With NCQ support and asynchronous request processing in place, the driver is able to achieve a performance that is on par with modern Linux drivers. We measured a throughput of 75 MB/s for HDDs and 180 MB/s for SSDs when issuing sequential 4 KB requests. Feature-wise our AHCI driver offers read/write support for hard disks (HDDs or SSDs) and experimental read-only support for ATAPI devices (CDROM, DVD, or Blu-ray devices). One motivation to upgrade VirtualBox 4.3 with the Genode release 14.11 was to use the multi-touch feature of Windows guests. With this release, we took the opportunity to investigate and enable the feature using the multi-touch capable Wacom USB driver introduced with release 15.02. The first step was to capture the multi-touch input events in our USB port and extend the input back end to propagate the information via Genode's input session. We extended the input interface of Genode by a new event type "TOUCH" (class Input::Event), which stores the absolute coordinates of a touch event as well as the identifier of the touch contact. Each finger at a time on the touch screen is represented as a contact with such a number/identifier. Nitpicker, nit_fb and the window manager propagate this new type of event to clients, which may process them if capable, as is the case for VirtualBox. Finally, we extended the input back end of our VirtualBox port to process Genode's input touch events so that the USB models in VirtualBox can utilize them. A few years back, we ported OSSv4 to Genode to account for the need of playing audio on Genode. It worked fine on a handful of sound cards but unfortunately, it did not work well on more recent Intel HD Audio devices. Though that shortcoming was more a problem of our own port than of OSSv4 itself, we decided to replace it rather than trying to fix the port. The rationale behind this decision is the uncertain future of the OSSv4 project. A driver with an active upstream development is certainly preferable. By now, we gained a solid experience in porting drivers from other OSs and developed a best practice that served us well. In the past, we mostly chose Linux as driver donor. But this time, we went in another direction and picked OpenBSD. One of the reasons for favouring it is its comprehensive documentation that helped a lot in implementing the APIs. There is normally one interface for a specific task used throughout all drivers whereas, on Linux, several interfaces and different drivers tend to use the interface that was popular at the time of their creation. We found the perceived code hygiene noticeably higher on OpenBSD than on Linux. Since porting a driver from a foreign OS involves picking the right layer to extract the driver, we took a closer look at the overall audio architecture of OpenBSD. At the highest level, it uses the sndio(7) interface. A user-land daemon sndiod(1) performs stream mixing, format conversion, exposes virtual devices to its clients, and controls the actual audio device provided in the form of the audio(4) device-independent driver layer. This layer abstracts the particular audio-device driver. It provides device-agnostic means to configure the device and to control the mixer. The device driver plugs into the audio(9) kernel interface. Genode contains its own user-land server/client audio interface, namely the Audio_out session. Therefore, we dismissed the use of the sndio(7) interface because it would involve porting sndiod(1) as well as changing all our audio clients. Merely porting the device driver and using the audio(9) kernel interface directly would have given us the most flexibility indeed but we would have been in charge of setting up the environment, e.g., DMA buffers etc., for the device driver. The audio(4) subsystem, on the other hand, does all this already and provides us with the common device interface, i.e., read(2), write(2), and ioctl(2). On these grounds, the audio(4) layer was selected as the porting target. The ported drivers are located in repos/dde_bsd/. The driver back end resides in the form of library in repos/dde_bsd/src/lib/audio whereas the driver front end providing the Audio_out session is placed at repos/dde_bsd/src/drivers/audio_out. As we did previously with other ported drivers, we created an emulation header, in this case called bsd_emul.h that contains all needed definitions and data structures. All vanilla OpenBSD source files are scanned and symlinks, named after the header files in the include directives, are created. Each symlink points to the emulation header. After that, the needed functionality is implemented. Since OpenBSD uses a rather static approach on how the kernel is configured, i.e., which subsystems and drivers are included, we needed to provide the parts required by the autoconf(9) framework. Basically, we provide the config data structure that contains the drivers (the audio subsystem as well as the audio device drivers) and implemented some other functionality that normally would be generated by the config mechanism in vanilla OpenBSD (see repos/dde_bsd/src/lib/audio/bsd_emul.c). The rest of the implementation, including the memory management and IRQ handling, turned out to be straight forward. In addition, the back end also implements the functions declared in the private Audio namespace (see repos/dde_bsd/include/audio/audio.h and repos/dde_bsd/src/lib/audio/driver.cc). The front end exclusively calls these functions and has no knowledge of the driver back end ported from OpenBSD. In this respect, these functions encapsulate the interface exposed by the audio(4) interface. To play the content of a packet received via the Audio_out session, the front end will simply call Audio::play(). This function internally calls audiowrite() after preparing the needed 'struct uio' argument by this function. audiowrite() is called in a non-blocking fashion. This is necessary because the audio-out driver operates as single-threaded event-driven process. If it blocked, it could not handle IRQs generated by the audio device. Last but not least, the write function copies the samples into the DMA buffer and calls the device driver to trigger the playback. After a block from the DMA buffer has been played, the audio device will generate an interrupt, which will poke the front end. The front end responds by requesting the playback of the next audio packet. The driver currently supports Intel HD Audio (Azalia) and Ensoniq AudioPCI (ES1370) compatible audio devices and is based on OpenBSD 5.7. It can be tested by executing the run script repos/dde_bsd/run/audio_out.run. This run script needs a sample file. Please refer to repos/dde_bsd/README for the instructions on how to create such a file. We improved the generic SD-card protocol implementation with the ability to handle the version 1.0 of the CSD register, which contains the capacity information of older SD cards. At os/src/drivers/sd_card/rpi, there is a new driver for the SDHCI controller as featured on the Raspberry Pi. As of now, the driver operates in PIO mode only. Depending on the block size (512 bytes versus 128 KiB), it has a throughput of 2 MiB/sec - 10 MiB/sec for reading and 173 KiB/sec - 8 MiB/sec for writing. At os/src/drivers/sd_card/imx53, there is a new driver for the Freescale eSDHCv2 SD-card controller as used on the USB Armory platform. The configuration of the highest available bus frequency and bus width is still open for further optimization. The increasing interest in the combination of Genode and the Freescale i.MX6 SoC motivated us to add official support for a board based on this SoC to our custom kernel. We settled on the Wandboard Quad that was developed on a volunteer basis. Thanks to Praveen Srinivas (IIT Madras, India) and Nikolay Golikov (Ksys Labs LLC, Russia) who contributed their work on i.MX6. The Wandboard Quad features 2 GiB of DDR3 RAM and a quad-core Cortex-A9 CPU. So, unlike when porting i.MX53, our existing kernel drivers for the Cortex-A9 private peripherals, namely the core-local timer and the ARM Generic Interrupt Controller could be reused. Although the board even supports SMP and the ARM Security Extensions, we don't make use of these advanced features yet. However, our port is intended to serve as a starting point for further development in these directions. The USB driver has become able to generate a report with a list of all currently connected devices, which gets updated when devices are added or removed. This information can be useful to decide if and when a USB session for a specific device should be opened or closed. There is no distinction yet for multiple devices of the same type. As with the previous releases, we continuously improved our version of VirtualBox running on top of the NOVA microhypervisor. We enabled the "VirtualBox Graphics Adapter" device model, which improves the performance of screen-region updates in comparison to the standard VGA adapter device model, and which allows the integration of the guest mouse pointer with the nitpicker GUI server. The mouse pointer integration has been realized in two steps. First, we extended VirtualBox to generate a "shape" report with the detailed information about the mouse pointer shape. The counterpart is a specialized vbox_pointer application, which receives the shape report as ROM file (provided by the report_rom component) and draws the mouse pointer accordingly when a nitpicker view related to VirtualBox is hovered. With the availability of the USB session interface and the new USB device-list report feature of the USB driver, it is now possible to pass a selection of raw USB devices directly to VirtualBox guests. <DeviceFilter name="USB Scanner" active="true" vendorId="04a9"
The feature was successfully tested with HID devices (mouse, keyboard) and a flatbed scanner. Mass storage devices are known to have problems, though we also observed these problems with VirtualBox on Linux without the closed-source extension pack. When using this feature, it should be made sure that the USB driver itself does not try to control the devices to be passed to VirtualBox. For example, when passing-through a HID device, the <hid/> config option of the USB driver should not be set. Since last summer when the seL4 kernel was released under the General Public License, we entertained the idea to run Genode on this kernel. As the name suggests, the seL4 kernel is a member of the L4 family of kernels. But there are two things that set this kernel apart from all the other family members. First, with the removal of the kernel memory management from the kernel, it solves a fundamental robustness and security issue that plagues all other L4 kernels so far. This alone would be reason enough to embrace seL4. Second, seL4 is the world's first OS kernel that is formally proven to be correct. That means, it is void of implementation bugs. This makes the kernel extremely valuable in application areas that highly depend on the correctness of the kernel. The first article describes the integration of the kernel code with Genode's source tree and the steps taken to create a minimalistic root task that runs on the kernel. It is full of hands-on information about the methodology of such a porting effort and describes the experience with using the kernel from the perspective of someone with no prior association with the seL4 project. The second part of the article series examines the seL4 kernel interface with respect to synchronous inter-process communication and the management of virtual memory. The third article presents the steps taken to bring Genode's core and init components to life. Among the covered topics are the memory and capability management, inter-component communication, and page-fault handling. The article closes with a state of development that principally enables simple Genode scenarios to run on seL4. With the current release, we have integrated the intermediate result into the mainline Genode source tree. At the time of the release, Genode's core and init components are running, and init is able launch further child components such as simple test programs. Still, the current level of seL4 support should be understood as a proof of concept and is still riddled with several interim solutions and shortcomings. Please refer to the third article linked above for the details. Functionality-wise the most glaring gap is the unimplemented support for user-level device drivers, which rules out most of the meaningful Genode scenarios for the time being. Still, the current version shows that the combination of seL4 and Genode is viable. After compiling the Genode components (init, core, and test-printf), the run script will build the kernel, integrate a boot image, and run the image inside Qemu. You will be greeted with the output of the test-printf program, which demonstrates that core, init, and test-printf are running (each in a different protection domain) and that the components can interact with each other by the means of capability invocations. The vanilla NOVA kernel provides asynchronous signalling by the means of semaphores. This mechanism offers a way to transfer one bit information from a sender to one receiver at a time. So a thread may block by issuing a "down" operation on a semaphore and wakes up as soon as the sender issues an "up" operation. However, Genode's signal abstraction for asynchronous notification requires that a receiver may potentially receive from multiple sources at a time, which rendered this kernel feature unusable to be directly used by Genode's signal framework. The receiver's blocking IPC returns. The context information about the signal is delivered with the IPC reply. Besides all the book keeping in core, this approach requires at least 4 inter-address-space context switches. Ideally, this could be just one context switch with a proper kernel mechanism in place. On the course of updating the platform driver and the redesign of Genode's IRQ session interface to operate asynchronously across all supported kernels, we took the chance to extend the NOVA kernel to meet Genode's needs more closely. We extended the NOVA kernel semaphores to support signalling via chained semaphores. This extension enables the creation of kernel semaphores with a per-semaphore value, which can be bound to another kernel semaphore. Each bound semaphore corresponds to a Genode signal context. The per-semaphore value is used to distinguish different sources of signals. Now, a signal sender issues a submit operation on a Genode signal capability via a regular semaphore-up syscall on NOVA. If the kernel detects that the used semaphore is chained to another semaphore, the up operation is delegated to the chained one. If a thread is blocked, it gets woken up directly and the per-semaphore value of the bound semaphore gets delivered. In case no thread is currently blocked, the signal is stored and delivered as soon as a thread issues the next semaphore-down operation. Chaining semaphores is an operation that is limited to a single level, which avoids attacks targeting endless loops in the kernel. The creation of such signals can solely be performed if the issuer has a NOVA PD capability with the semaphore-create permission set. On Genode, this effectively reserves the operation to core. Furthermore, our solution upholds the invariant of the original NOVA kernel that a thread may be blocked in only one semaphore at a time. This makes our extension non-invasive and easily maintainable. We applied the same principle to the delivery of interrupts by the NOVA kernel, which corresponds to a semaphore up operation. With minor changes, we have become able to deliver interrupts as ordinary Genode signals. The main benefits are a vastly simplified IRQ-session implementation in core and the alleviation of the need for one thread per interrupt. The interrupt gets directly delivered to the address space of the driver (MSI), or in case of a shared interrupt, to the PCI driver. The tool chain has been updated to Binutils version 2.25 and GCC version 4.9.2. This update comprises both the cross tool chain running on Linux as development environment and the tool chain running within Genode's Noux runtime environment. To use Genode 15.05, please obtain and install the new binary version of the tool chain available at http://genode.org/download/tool-chain or build it manually via the tool/tool_chain script. We declared the support for Qt4 as deprecated in 2013. Since we switched to Qt version 5 on Genode long ago, we finally removed the repos/qt4/ repository. The repos/base-host/ repository was originally envisioned to be the ideal place to document the framework-internal interfaces between the kernel-agnostic and kernel-specific parts of the framework. It was meant to provide mere stub functions that enable the compilation of Genode-API-compliant code directly using the host compiler. However, it remained an obscurity. Since it is neither used nor regularly tested, we decided to remove it. The GTA01 platform support was originally added in 2006 to run Genode on the Gamepark GP2x handheld console. The code remained unused and unmaintained for several years. The original ATAPI driver is superseded by our new AHCI driver, which principally also supports ATAPI devices. However, IDE support has been dropped as it is not relevant on our current-day target platforms. The demo device driver (D3M) was created for the OKL4-based live system released in 2010. Since then, it was in irregular use for a few demonstration scenarios but has never evolved into a fully-fledged driver manager. Since all of D3M's functionality except for the probing of boot media is covered by a combination of other components, we decided to remove D3M. The linux_drivers repository hosted device drivers ported via the original DDE-Linux approach. We disregarded this approach in 2012. The only remaining code worth keeping is the i915 GPU driver, which will potentially re-appear in our modern repos/dde_linux repository. The repos/dde_oss was an experiment to run the audio drivers of the OSS project directly on Genode. Unfortunately, the contained Intel HD Audio driver did not work on any Thinkpad models newer than T60. With the current release, this repository is superseded by the repos/dde_bsd repository.